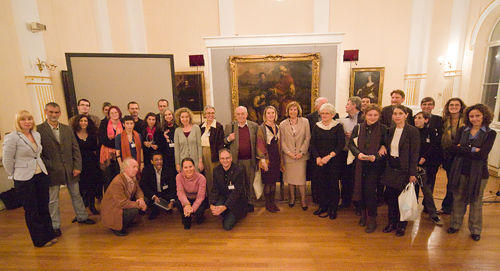 The Third World Culturelink Conference was held in Zagreb from 13 to 15 November 2009, bringing together Culturelink Network's members, researchers, artists, professionals, and many others who perceive networking as one of the most intriguing phenomenon of contemporary culture. It was attended by 130 participants from all continents, representing research organizations, national and international associations, foundations, cultural institutions and universities. The event marked the 20th anniversary of the Culturelink Network, that was established in 1989 by UNESCO and the Council of Europe. The Institute for International Relations (IMO) in Zagreb, Croatia has been the focal point of the Culturelink Network since its inception. In an introductory video-address, the conference participants were greeted by Jean-Pierre Saez, Director of the Observatory for Cultural Policies, which also marked the 20th anniversary of its work and cooperation with Culturelink. The conference was opened by representatives of the UNESCO Office in Venice, the Council of Europe, the Ministry of Culture of the Republic of Croatia, the Institute for International Relations and the City Council of Zagreb, who all indicated the significance of the work of the Culturelink Network in the past twenty years. In the following two days, the Third World Culturelink Conference worked in four plenary sessions, aiming to investigate the role and relevance that cultural networks hold for cultural development in the 21st century. A retrospective overview of the cultural networks phenomena in the past 20 years was meant to provide grounds for debate on new perspectives of cultural networking. Special consideration was given to issues regarding the position of cultural networks within cultural policies structures, as well as to the effective usage of innovative ICT and networking applications that significantly developed the modes and scopes of activities of cultural networks. The first plenary session entitled Twenty Years of Cultural Networking reflected on the successful history of the Culturelink Network in the context of the general development of networks during the past twenty years. Presentations in this session focused on general issues within the context of networking but also analyzed current trends and relevant practices through several case studies from Europe, Australia and the Asia-Pacific region. They highlighted the need to revisit the concept of establishment and initial development of cultural networks as well as the current status of networks, key agents, and dominant approaches and challenges. Firstly, the Culturelink Network was reviewed from the perspective of one of its founder organizations, UNESCO, indicating the high standards of the work of Culturelink and its value, especially in light of some actions that UNESCO could not be accounted for. Secondly, the work of Culturelink was put into historical perspective from its regional centre APRCCN in South Korea. It has been noted that in the future the Culturelink Network should reinforce its global strategies in close consultation with regional centres and thus create joint actions. The emphasis on the changing nature of cultural networks and the challenges that the future brings were put to the fore by some presentations - from the perspective of donors, other cultural networks, and from the point of view of independent researchers. The discussion in the first session concentrated on the issue of the (self)evaluation of networks and networking processes and their sustainability - generally agreeing that through the daily communication in networks it can be deciphered whether they are successful or not, the participants still highlighted difficulties for the evaluation process. One difficulty is the very character of the network - the openness of its structure creates obstacles: the nature of the network is to be in constant flux, and evaluation results depend on the point from which the evaluation is being undertaken. The question was raised whether an abundance of networks existed, and if the overlapping of some of their activities and projects could be minimized with external evaluation and/or better interconnectivity among cultural networks. Finally, the question of whether cultural networks were prepared for change and implications of the digital environment opened the space for the second session in the conference programme. The second plenary session dealt with the Effects of ICT and Digital Culture on Networking Dynamics. Questions were raised concerning actual cultural practices and their efficacy in linking diverse cultural contexts, strategies of sustainable development, the technology which facilitates cultural interaction and the way it shapes cultural practices in a constantly changing landscape of digital communication. A range of different topics was presented: from blogs, artistic innovations, virtual museums, via the possibilities of using Web 2.0 and 3.0 and creating art in Web 2.0, to more theoretical questions concerning deterritorialization and hyper-territory. The effects of ICT were explored through different artistic examples which can sometimes be hard to finance and brand because of their specific nature. Art organizations are presently changing because new creators require increasingly specific skills and knowledge. The role of the author in the arts is changing and artistic goals are becoming more plural and interdisciplinary, requiring partnerships and open communication. Possibilities of private-public partnerships were explored through the example of a specific virtual museum. Further changes were registered in new communication tools, as we can observe the social colonization of the Internet and the population of the Web with different types of interaction. Participation in this new type of communication is becoming more active because people can exchange ideas more dynamically. Art in such a context bridges different types of artistic expressions, brings interconnectedness, cooperation, dialogue, and new types of meeting platforms. In this context, the rise of the 'digital natives' was highlighted, those immersed in a digital environment from an early age, having different perceptions of digital ecology and cultural development. A new space of flow and mobility which transcends spatial relations is rising. This is reflected in the concept of deterritoriality, in which cyber-space is replacing real space and creating a new type of hyper-territory, e.g. social networks as the new territory. The discussion that followed the presentations in the second session offered further interesting points and led to the implicit conclusion that new technologies present an ambivalent challenge - they can pose threats but also open up new possibilities. What is needed is adaptation to these changes, bridging the digital divide, working on education, and learning the language of the Internet. Ownership and regulation of the Internet were seen as another set of problems which bring with them control and the loss of privacy. However, what is crucial is the way we use technology and the new practices that are created. ICT allows us to communicate in a particular manner, whether in artistic creation, everyday communication or in doing business. The way, in which we make use of the technology and the new practices that are created, is crucial. The second day of the Third World Culturelink Conference was opened by the third plenary session of the programme entitled Cultural Networks and Cultural Policy. The status of cultural networks in relation to national and trans-national policy making was questioned, as well as innovative practices and forms of cultural policy-making in the local and global contexts. This session highlighted the importance of the redefinition of cultural policies in the light of the convergence of culture, the digital environment and the overall global interconnectedness of economic, political and social changes. Key issues of the value of cultural networks were underlined through examples and experiences from Latin America, Africa and Asia, and their socio-cultural significance in these regions. It has been noted that the concept of 'cultural network' was adopted by the cultural sector very quickly, but many obstacles in this regard remain. Some of these obstacles are the instrumentalization of culture, the overregulation of the cultural field, and the proliferation of global 'cultural/creative discourse industries' that produce contradictory implications on the local level. The multiplication of programmes of various cultural networks and the problems of funding were again emphasized as some of the key problems of cultural networks in their day-to-day functioning. The discussion following the presentations showed that there is a lot of work to be done in regard to cultural policy and cultural networks: we have entered a new era of cultural policy-making – the old models are breaking down. Although the participants noted that substantial work was being done in transnational cultural policy on behalf of the Council of Europe, it was stressed that cultural networks were not even nearing the urgent tasks lying ahead of them under the new global economic and political conditions. An urgent need for cultural movements exists, which could voice the emerging problems of culture that reflect the new digital environment. Cultural networks have not yet reached maturity, it was suggested, and it is of outmost importance to work on the innovative forms of cultural policy-making in the local and global contexts. The fourth plenary session was devoted to the Evolving Networking Culture. It highlighted the networking culture within its current context, and identified areas of shared concern, which generated discussions on crucial questions about the development of cultural networking and the possible future of cultural networks. The need to identify priority issues of common interest, and establish effective strategies that will lead to the next stage of development of cultural networks in a constantly changing technological, socio-economic and cultural environment, was also highlighted. The construction of networks in new environments was discussed, and a number of examples, including trade unions of different cultural groups were presented. Although efficient in connecting with diverse networks and cooperating with different regions, their influence on changing cultural policies remains limited because of difficulties in changing existing cultural paradigms. Mobility was seen as a resource with limited accessibility but with the possibility of creating new connections and sharing of resources. It promotes freedom of expression and creates a common and shared space. However it can also bring some problems. For example, although face-to-face interaction is optimal for cultural networking, the carbon-footprint of the mobility of cultural workers can pose serious environmental problems. Networks should therefore refresh their practices and create new ways of communicating with each other, or they will stagnate. They were also seen as informal living systems of education and models for finding different partners; members of networks need to destabilize themselves in order to surpass their own limits. Not only cultural workers, but also cultural goods, services, etc. are crossing different borders and are becoming more and more transnational, and therefore new types of policies are needed. There is a significant deficit and lack of information between different nations in existing cultural networks (e.g. Latin America). This seems to imply that people are less convinced and sure of their own actions as members of different networks. In the final discussion, calls for action were made in order to develop a social movement in the cultural field. Main agendas of possible action for such movement are as follows: trade in cultural goods and services, implications that the Internet has for culture, cultural development and poverty alleviation, and media concentration. In the wrap-up of this session, it has been concluded that there are many obstacles for the possibility of creating cultural movements. The Third World Culturelink Conference was closed by Biserka Cvjetičanin, Director of the Culturelink Network, who thanked all Culturelink members and founders for their support during past twenty years. She also thanked all conference participants for their lively discussions during these two days, and underlined that the cultural diversity of the participants had contributed significantly to the richness of the debates through the different approaches to the discussed issues. The publication of the conference proceedings is planned for the next year. The Third World Culturelink Conference highlighted the important transformations of cultural networking that took place in the course of the past two decades: thus, Biserka Cvjetičanin concluded, we are moving from networking of cultures to networked cultures, which is a significant step that leads us to face new challenges. One such challenge might be the emergence of networked identities, the research into which could be the theme of the Fourth World Culturelink Conference to be held in 2012.